LG really can't help itself, announcing more handsets that will be making an appearance at MWC 2013, this time in the shape of the new F-series. 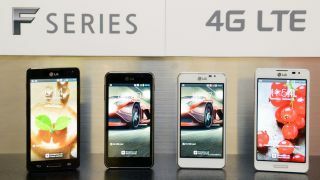 Last week the giddy Korean firm unveiled the Optimus L7 2, Optimus L5 2 and Optimus L3 2, which have now been followed by the LG Optimus F7 and Optimus F5. It promises that these new devices, dubbed "The Freedom" in a recent video teaser, will offer superfast 4G services and advanced features such as having two apps onscreen at the same time, something LG calls QSlide. From the way LG is pitching the Optimus F7 and Optimus F5 they are being lined up as more mid-range devices rather than premium handsets, and a quick glance at the specs backs this up. The LG Optimus F7 sports a modest 1.5GHz dual-core processor, 4.7-inch True HD IPS display, 2GB of RAM, 8GB of internal storage, 8MP rear camera, 1.3MP front camera and a 2540mAh, plus it comes running version 4.1.2 of Android Jelly Bean. Slightly lower down the chain is the LG Optimus F5 with its 1.2GHz dual-core processor, 4.3-inch IPS display, the same RAM, internal storage and front facing camera as the F7, 5MP rear camera and 2150mAh battery. It also runs the same version of Jelly Bean as the F7. The LG Optimus F5 release date is pegged for the second quarter of this year with the rollout starting across Europe, and the Optimus F7 will follow soon after in selected markets.